The Eversharp pencil was the brainchild of Charles R. Keeran, a native of Bloomington, Illinois and an inveterate inventor and entrepreneur. Nowadays most collectors take these seemingly ubiquitous all-metal pencils for granted, yet the original Eversharp was truly a groundbreaking innovation. The first mass-produced mechanical pencil to combine a simple propelling mechanism with large lead capacity and robust, ergonomically sound design, the Eversharp met with enthusiastic public acceptance. In the space of a few years millions were sold, not counting the numerous imitations which soon appeared, virtually all using the .046” (1.2 mm) lead that the Eversharp had established as a new standard. It was the Eversharp that redefined the mechanical pencil as a mass-market product, to the extent that "eversharp" came to be widely used as a generic term for a mechanical pencil. The first Eversharps were manufactured in December of 1913, but quantity production only began after Keeran joined forces with the Wahl Adding Machine Company of Chicago towards the end of 1915. The Eversharp was a huge success for Wahl, which soon abandoned adding machines entirely; Wahl also managed to outmaneuver Keeran, who was left with almost nothing. By 1921, Wahl-Eversharp was turning out 35,000 Eversharps every day, and had sold over 12,000,000 pieces. Eversharp pencils were made in a range of materials and a wide variety of sizes and surface finishes. Due to their large production numbers, the more common Eversharps are readily available at relatively modest prices. The scarcer variants, however, are also still highly affordable, although this may change as more collectors begin to appreciate the interest and variety of these pencils. NOTE: Many books and articles written by and for pen collectors state that the Eversharp pencil was invented in Japan. This is incorrect; a similarly-named pencil, the Ever-Ready Sharp, was invented in 1915 by Hayakawa Tokuji, who later went on to found the Sharp Corporation, but the Ever-Ready Sharp clearly postdates Keeran's invention, and there is no evidence that it was ever sold in the United States. 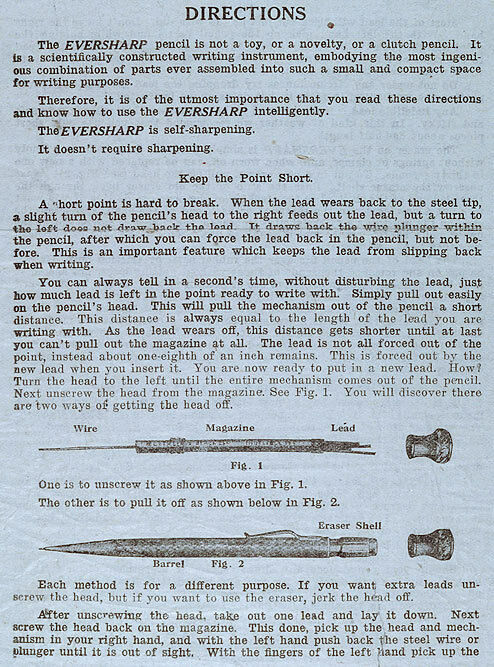 For more on the invention of the Eversharp pencil, read A Tale of Two Pencils. 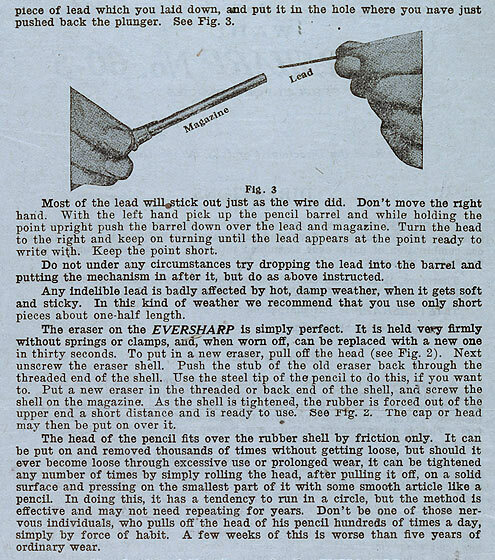 The instruction sheet below came with a pencil produced around 1918, though the illustrations are of a very early Eversharp with a Heath clip (it was not uncommon for manufacturers to keep using older printing blocks rather than pay for new ones). The directions provided are generally applicable to all Eversharp pencils of the teens and twenties.